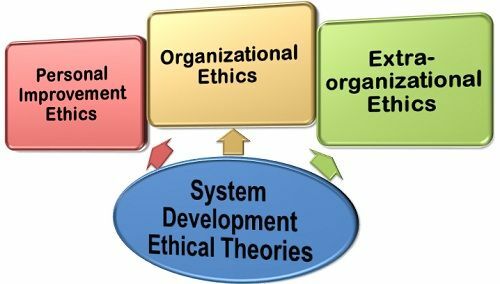 Definition: The System Development Ethical Theories state that the extent to which organization system is sensitive to the need to develop a work culture supportive of ethical conduct determines the ethical value of actions. Personal Improvement Ethics: The personal improvement ethics posits that the action is good if it is intended to promote the individual’s personal responsibility for the continuous learning, improvement, holistic development and moral excellence. For example, the employees in order to gain expertise in their work enroll in the company’s training programmes with a view to improving themselves as well as the organization’s functioning. Organizational Ethics: The organizational ethics hold that the action is right if it confirms the development of the formal and informal organizational processes which in turn enhances the procedural outcomes, respectful caring, innovation in ethical work culture and systematic justice. For example, If there is no employee complaints Redressal system in the organization and also the employees do not have a voice system for feedback then it is the responsibility of the manager to implement such system and give a voice to the employee. By doing so, the manager supports individual and organizational moral development and reduce the intense resistance to the overall moral development. Extraorganizational Ethics: The extra organizational ethics asserts that the action is right if it promotes or tends to promote the collaborative partnerships and respect the global and domestic constituencies representing the diverse political, economic, legal, social ecological and philanthropic concerns that affect the firm. For example, it is the social responsibility of a manager to consider all the factors external to the organization such as political, legal, social, environmental, etc. that can affect the organizational business processes. Thus, the managers who cautiously assess the moral conduct of his employees and retribute (punish) their wrong doings then he is said to have successfully developed the system of ethics. In case, the manager relies exclusively on the character of his employees and do not implement morally supportive Intra-organizational systems and stable processes; then the organization is exposed to the future ethical risk.